As a licensed amateur radio operator in Canada this is my personal interpretation of Safety Code 6. I am presenting this here for any like minded amateur radio operator who is interested in this topic. The Radiocommunications and Broadcasting Regulatory Branch of Industry Canada states in "CPC-2-0-03 Radiocommunication and Broadcasting Antenna Systems" (link) that Health Canada has established safety guidelines for exposure to radio frequency fields, in its "Safety Code 6" (link) publication. "Safety Code 6" states that current studies in Canada and other countries indicate that there is no evidence that a person will experience adverse health effects from exposure to radio frequency fields, provided that the installation complies with Safety Code 6. It is my responsibility that my amateur radio station comply with Safety Code 6 at all times. Safety Code 6 recommends general procedures for ensuring that exposure of the general public in the vicinity of RF devices is not greater than the levels specified in this Code. A safety factor of approximately 20 to 50 was incorporated with reference to the scientific-consensus threshold for adverse health effects. 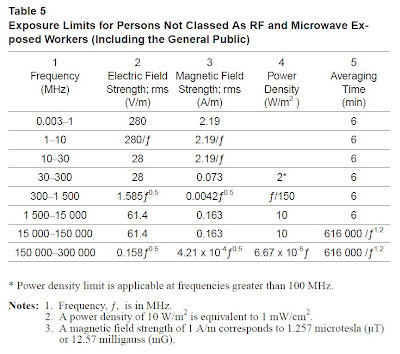 Within the 3 to 30MHz bands, a person shall not be exposed to electromagnetic radiation in a frequency band listed in Column 1 of Table 5, if the field strength exceeds the value given in Column 2 or 3 of Table 5, when averaged spatially and over time. The spatial averaging is carried out over an area equivalent to the vertical cross-section of the human body (projected area). A time-averaging period of 0.1 h (6 min) should be employed for frequencies up to 15 000 MHz. States that while Industry Canada expects radio amateurs to meet the requirements of Safety Code 6, generally most amateur installations will never exceed the recommended exposure limits. There are many reasons for this including the fact that most amateur installations are operated at relatively low power levels (typically 100 watts), are not on a 100% continuous duty cycle and the amount of transmission time is often limited." From 1 to 10MHz, Electric field strength is limited to 280/f (V/m) and Magnetic field strength to 2.19/f (A/m). From 10 to 30MHz, Electric field strength is limited to 28 (V/m) and Magnetic field strength to 2.19/f (A/m). For each band from 80m to 10m the table below captures the E and H field limits according to the safety code 6 definitions. I assume 200W output from my rig, which is worst case. 100ft of feed line is assumed with 1.3dB/100ft at 30MHz. To get the losses at other frequencies I scaled the loss by the frequency of each band. I assumed a 3dBi antenna gain which is correct for the Cushcraft R8 Vertical. Effective radiated power is 380W to 290W. Power density is calculated assuming a worst case 3m distance to the antenna. For PSK modulation I assumed a 50% time averaging over 6 minutes which is consistent with PSK operation, as I listen 50% of the time, and a typical transmission is much less than 6 minutes. On the other hand I assume duty cycle of 100% when I am transmitting. This factor would be less than 100% for SSB and CW for instance. I then calculated the resulting averaged E and H field strengths. Simply taking the ratio of the resulting field strengths and the limits results in a safety margin over and above Safety Code 6. A copy of this file is available at Google Docs at link. I would state that a Cushcraft R8 vertical at 3m, being fed with a with Rig power of 200W in PSK mode and 100ft of feed line will pass safety code 6. There are details concerning the Safety Code 6 in the near field which I have not reconciled. I believe the calculation above to be correct, however all should realize you are accountable for your own calculation, should you attempt to do one for your own station.